A classic Art Nouveau border of dynamic, biomorphic floral scrolls provides the essential design of this exquisite antique Irish carpet. 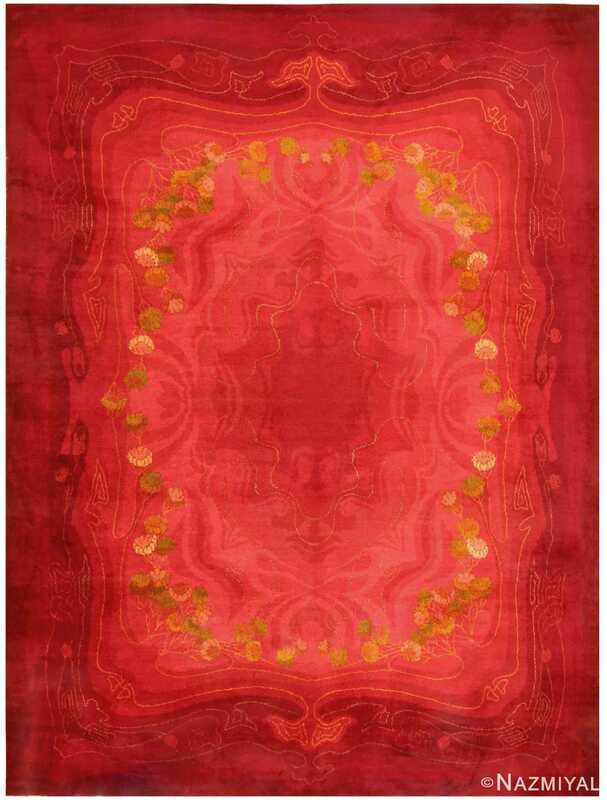 Antique Art Nouveau French Rug, Country Of Origin: France, Circa Date:: Early 20th Century – A classic Art Nouveau border of dynamic, biomorphic floral scrolls provides the essential design of this exquisite antique carpet from France. The deep blue green field is articulated only with sinuous, undulating wave-like forms in tone-on-tone coloration, giving it a cool, fluid, ocean-like effect. 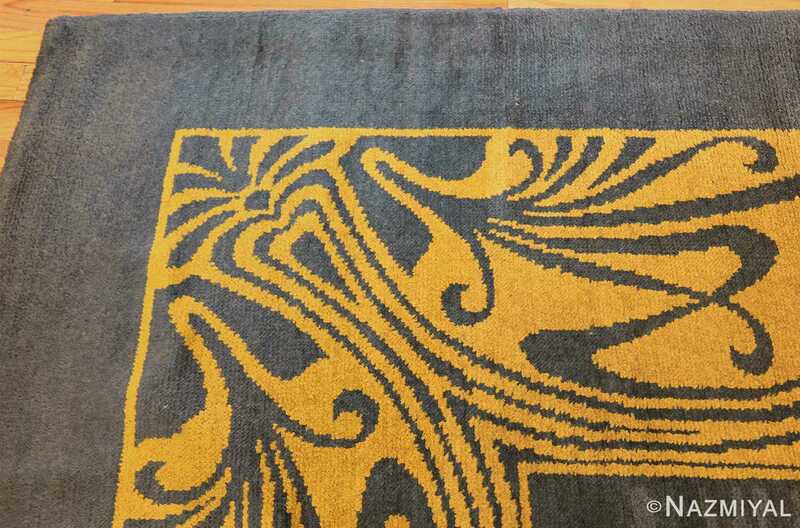 The contrasting gold ground of the border endows it with an even more impressive, monumental presence, underscoring the deceptive simplicity that is the very essence of great Art Nouveau design. Art Nouveau rugs are something special, as they offer a glimpse into the truly versatile nature of rug-making as an artistic medium. 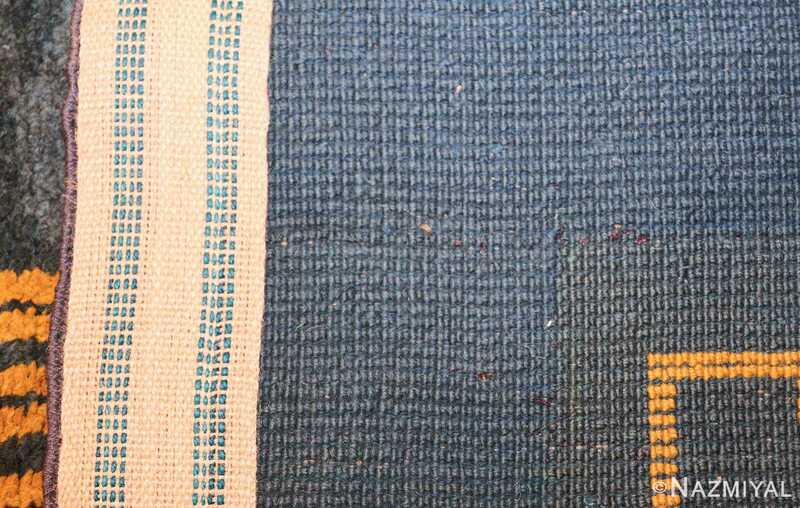 Just as other fields of visual art have evolved over the centuries, so too has rug-making. And when a particularly influential new style or trend descends on the art world, rug-makers take note just as painters and sculptors do. 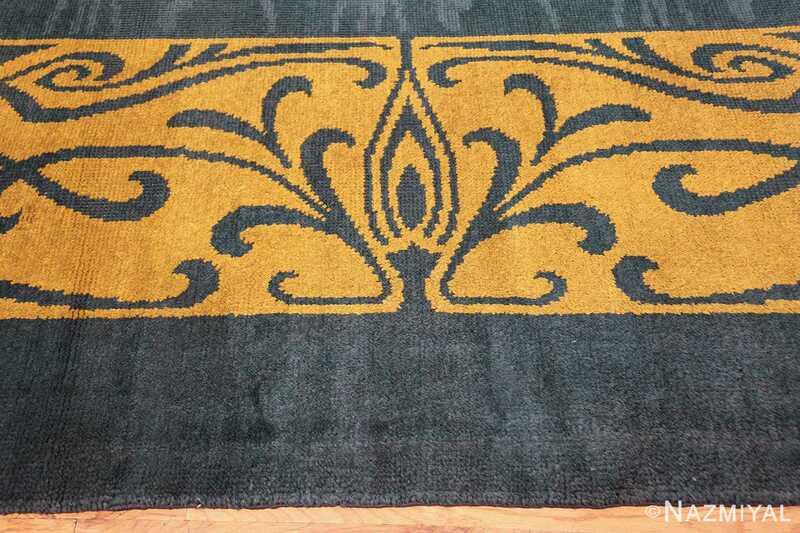 This Art Nouveau rug from Ireland is a choice example of the impact of the Art Nouveau movement on artists of all kinds. A gorgeous and inviting field of deep greens. A graceful border of striking gold. 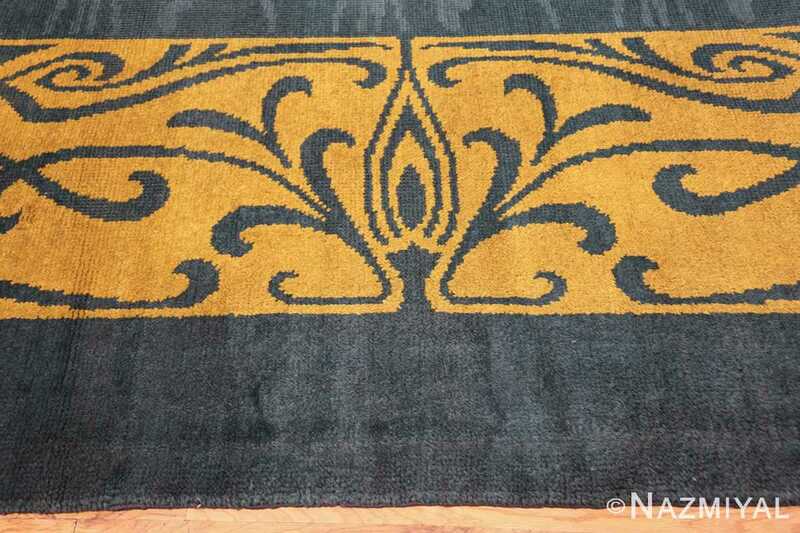 Such are the primary characteristics of this absolutely stunning antique rug and the subject of today’s Wednesday Wishlist – a classic Art Nouveau rug from early twentieth century Ireland. 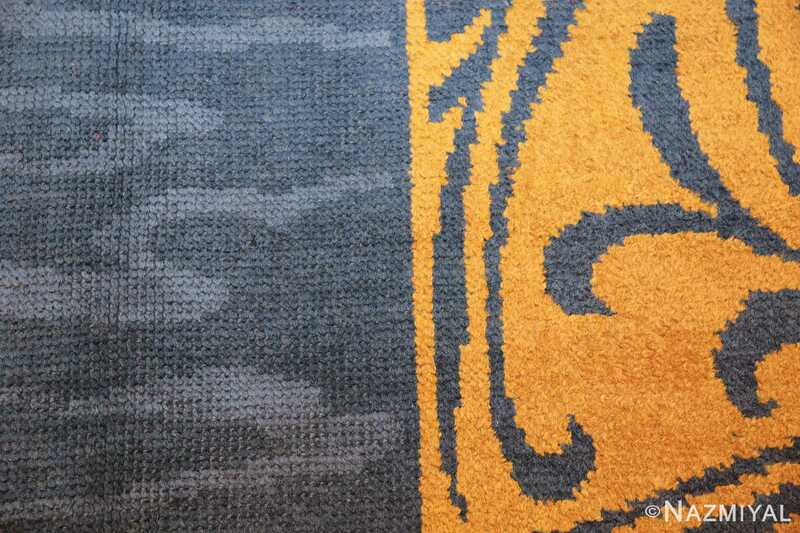 As beautiful as it is sparse in ornamentation, this masterwork of a rug is an incredible piece of history, having been meticulously hand-crafted with representative elements of Irish design and style by the most storied and well-known of all Irish rug-makers – the artisans of Donegal Carpets in Killybegs, County Donegal. Donegal Carpets are admired the world over for their quality and for the brilliance of their design. 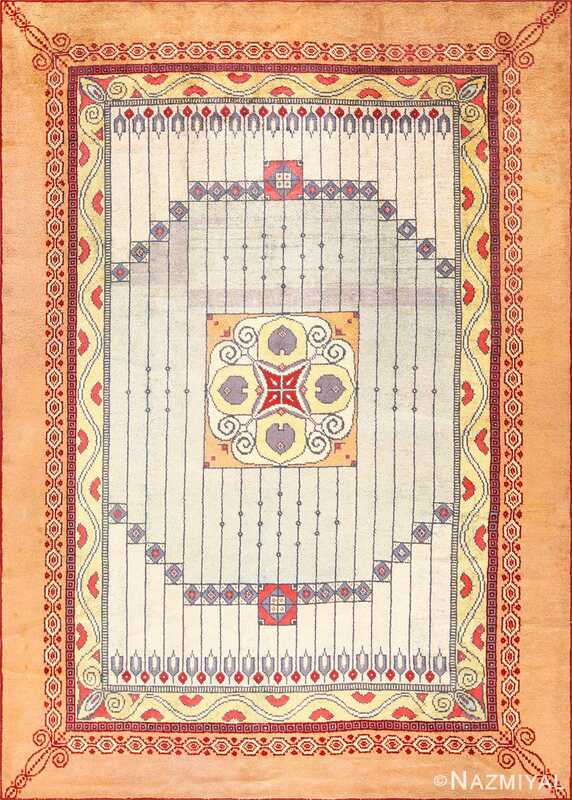 The finest of these antique rugs may be found in some of the most prestigious residences and museums in the world, including Dublin Castle, the Royal Pavilion of Brighton, Etham Palace, and even in the White House. 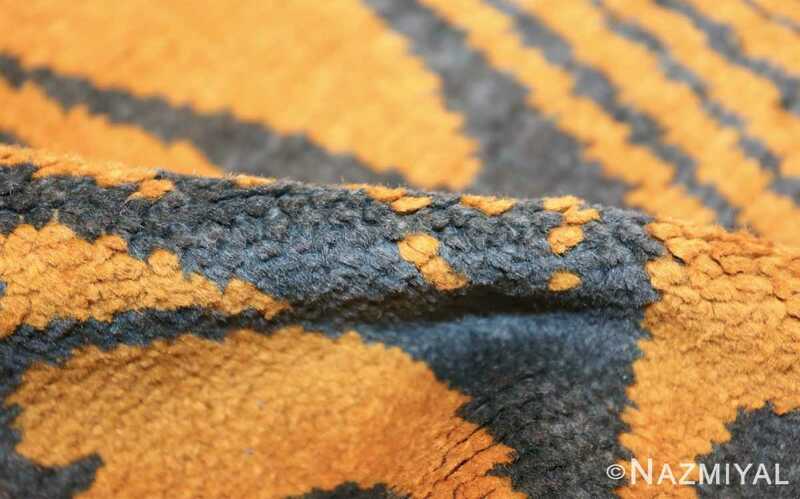 A testament to the long and proud tradition of rug-making in Ireland, Donegal carpets at their best espouse those qualities that separate artisan antique rugs from the machine-made rugs in such wide circulation today. 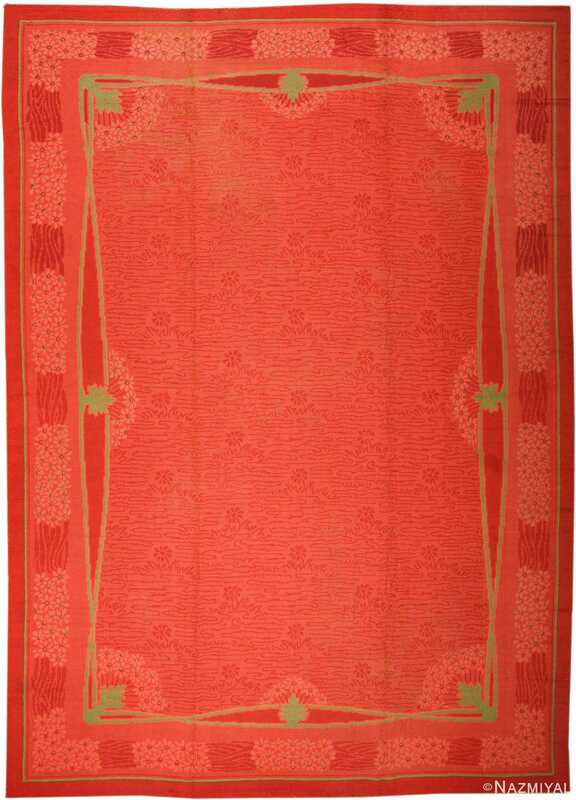 This particular piece is a study in the artistic possibilities inherent in rug-making, representing some of the very finest elements of the Art Nouveau movement that was so influential in the early twentieth century. 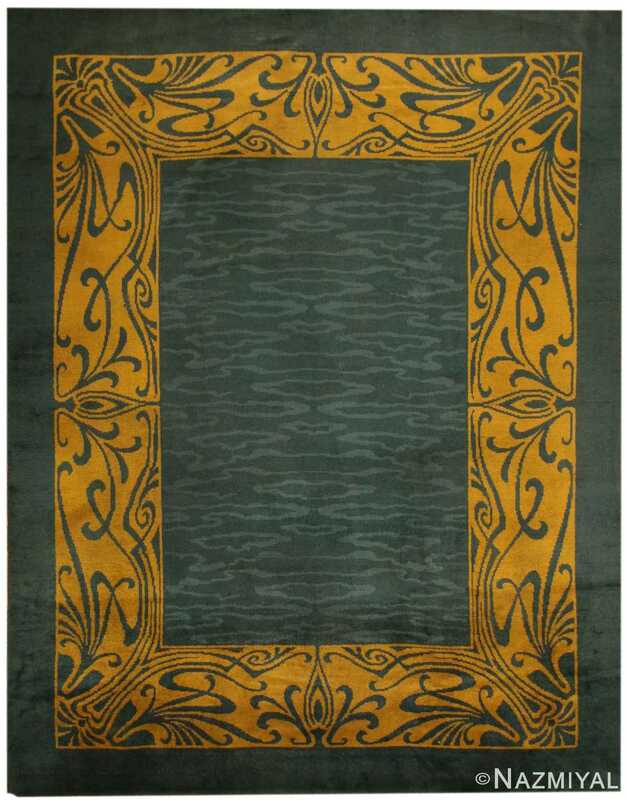 The prominent gold border, for example, with its biomorphic, floral scrolls, is very typically Art Nouveau. 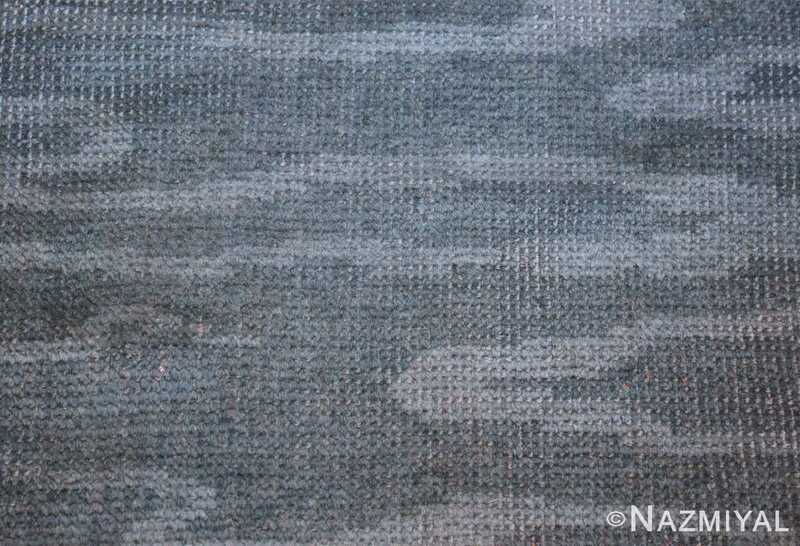 Further, the organic feel of the rug – brought home by the simplicity of the field, the two-toned coloration of which creates the impression of a gentle, softly cascading ocean – makes this a quintessentially Art Nouveau rug: this was an artistic movement that largely stressed the inherent beauty of the natural world, which may not possess superficial symmetry or exactness, but is abundant with organic sublimity. As Irish as it is Art Nouveau as it is a beautiful work of art, this Donegal carpet is something special. 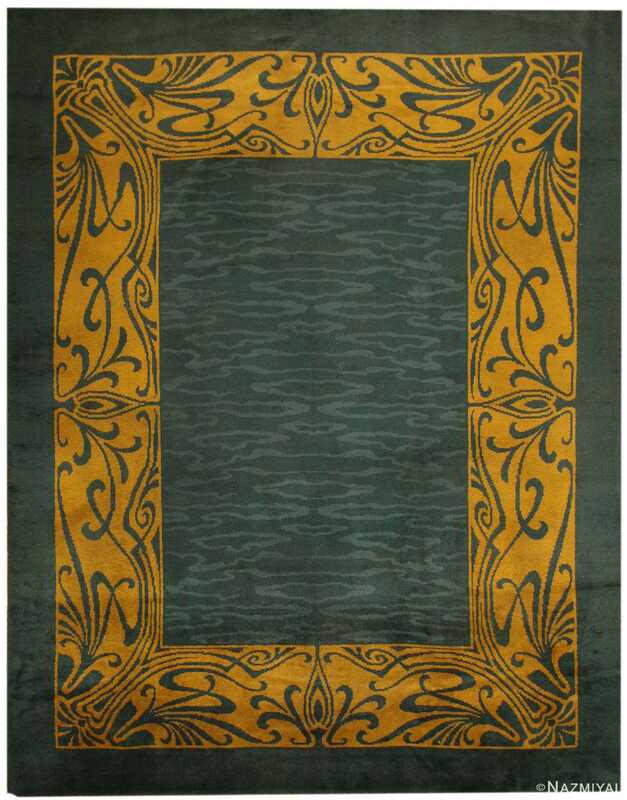 And after our interview with Dublin-based artist David Thomas Smith on Monday, we felt especially inclined to keep up the conversation about the amazing contributions of Ireland to the world of art, and we felt that this beauty of an Art Nouveau rug was just the way to do it! Happy Wednesday to all, and may the luck of the Irish be with you! 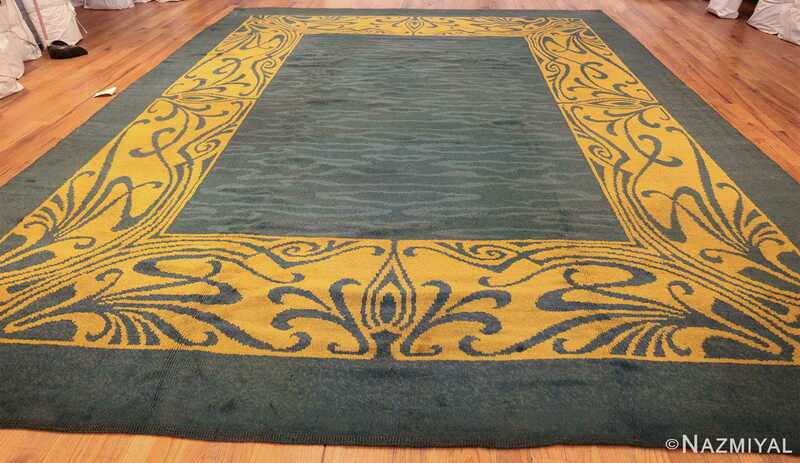 The borders of this lovely antique French carpet of the early 20th century are classic Art Deco, as are the lilies on its delicately colored field.